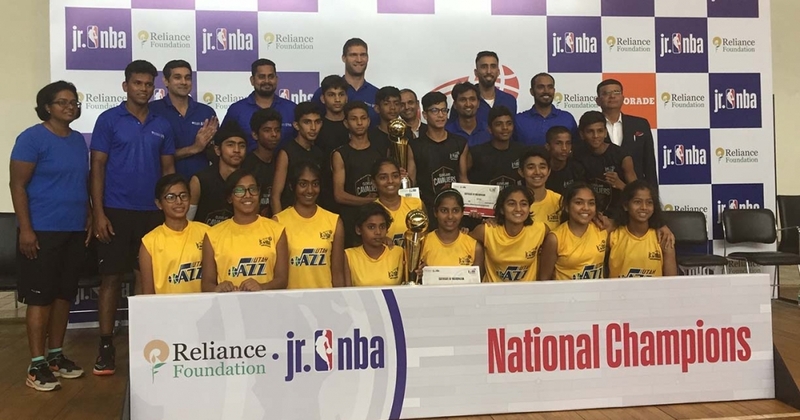 NOIDA, INDIA – MAY 3: The Reliance Foundation Jr. NBA National Finals took place at the NBA Academy in Noida, India from April 29-May 3. The event brought together All-Stars from each of the eight main Jr. NBA cities in the country – Bengaluru, Chennai, Delhi, Hyderabad, Kerala, Kolkata, Mumbai, and Punjab – as the program’s top 160 players represented the 5.4M youth participating in Jr. NBA across India. Bengaluru (Girls) and Delhi (Boys) won their respective championships, and will advance to the Jr. NBA World Championship this August at the ESPN Wide World of Sports Complex near Orlando, Florida. Bengaluru defeated Chennai, 41-36, after overcoming a 13-point deficit early in the first half. Chennai jumped out to a 12-0 lead to start the game. However, Bangalore came back in the 2nd, cutting the lead to 25-22 at halftime. Bengaluru took the lead in the second half, and extended it to 7 points in the 4th quarter. Chennai closed the gap to 3 going into their final possession, but ultimately failed to pull even. On the boys side, Delhi also fell behind early against Kolkata, leading to a 36-24 score going into halftime. A high-scoring 3rd quarter belonged to Delhi – as they cut the lead to 3 going in the 4th, 52-49. With a trip to the World Championship on the line, Delhi took its first lead of the game with 8:30 remaining. There were 3 lead changes in the following minutes, but Delhi went on a quick run down the stretch to close it out, winning 81-71. Yannick Colaco, Kenneth Juster (the U.S. Ambassador to India), the CEO of Reliance Foundation’s Sports Division, and Brook Lopez were in attendance for the games. Ambassador Juster spoke at halftime of the boys game to congratulate the teams that will represent India at the World Championship.